Sha­ka Pops founders Chris­tine Vest­fals and Lar­ry Lutz fell in love with Maui when they were mar­ried here in 2003. Ensconced in cor­po­rate Amer­i­ca, like so many oth­ers they could only dream of mov­ing to Maui. A twist of fate gave them the oppor­tu­ni­ty to take a chance and real­ize their dreams at a time when gourmet ice pops were gain­ing pop­u­lar­i­ty. Raised by a health con­scious moth­er in a home where Chee­rios was con­sid­ered junk food, Chris­tine turned to her roots and began test­ing recipes for fresh fruit pops on her friends and fam­i­ly. Lar­ry was fin­ish­ing up his MBA stud­ies, so he wrote a busi­ness plan as part of his pro­gram (he got an A!). A few months lat­er, after putting their house up for sale and tap­ping into their sav­ings, they were liv­ing the dream on Maui. 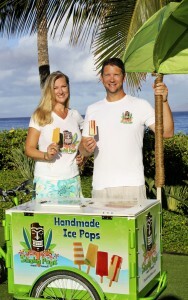 Sha­ka Pops made its debut at Whale Day on Feb­ru­ary 18, 2012 with only six fla­vors, but the impact was imme­di­ate. When one cus­tomer came back five times, bring­ing friends and even strangers to try the pops, the cou­ple knew they had a hit. Two years lat­er, the Sha­ka Pops pop cart is a fix­ture at local events, fes­ti­vals and farm­ers mar­kets. Their pops can be found in over two dozen retail stores, restau­rants and resorts around the island, as well as their mobile loca­tion in Hana.